I spend a lot of time thinking about the future. What will happen to me? Will I be happier tomorrow than I am today? More succesful? Will I have children? Be a grandmother? This design was created at a time of personal transition for me: finishing a two-year stay in Europe, and beginning a new job in New Mexico, which seems to be the polar opposite of the place I am leaving. I am saying goodbye to dear friends, and hoping to meet new ones, equally dear, wondering what the future holds, and sitting in awe of Fate and its constant surprises...wishing for the ability to forecast my own destiny. Forecast is a whimsical combination of textures. Braided cables accented with tiny eddies of bobbles travel down each panel over a corrugated garter-stitch background, like swiftly moving streams over ploughed fields. The yarn is my favorite Cascade 220 tweed, in a beautiful bright-dark blue-purple with flecks of red and yellow that reminds me of sunrise. Slightly belled sleeves are cinc hed at the wrist by bordered ribbing, and the same ribbing used at the waist to provide a slimming, shapely silhouette. This design is an example of how to achieve complex-looking shaping using only textural changes. 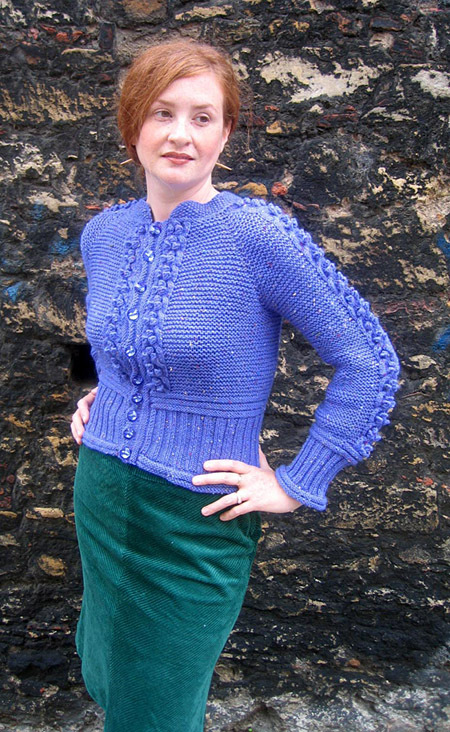 This pattern is knit flat on circular needles from the neckline to the hem. 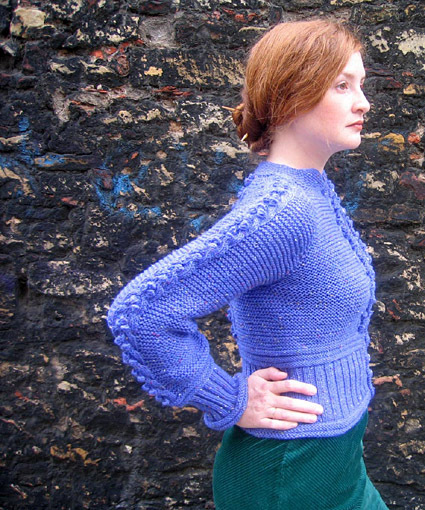 The sleeves are knit flat and seamed later, but could easily be knit in the round. The button bands are picked up and knit from the cardigan front edges. Slip next 2 sts to cable needle and hold to front of work, k2, k2 from cable needle. Slip next 2 sts to cable needle and hold to back of work, k2, k2 from cable needle. This cable chart is from "The New Knitting Stitch Library" by Lesley Stanfield. Lark Books, 1992. Make bobble: K into front, then back, then front, then back, then front again, of next stitch (4 sts increased), turn work; p5, turn work; pass second, third, fourth and fifth sts over first st, then k this st through back loop. Using smaller needle, CO 72[72, 80, 80, 80] sts. Row 1 [RS]: Sl 1, kfb, [k1, p1] to end. Row 2 [WS]: Sl 1, kfb, [p1, k1] to last st, p1. Row 3 [RS]: Sl 1, kfb, [p1, k1] to end. Row 4 [WS]: Sl 1, kfb, [k1, p] to last st, k1. Rows 5 & 6: Work as for Rows 1 & 2. 78[78, 86, 86, 86] sts. Rows 7, 9, 11 [RS]: Sl 1, [k1, p1] to last st, k1. Rows 8, 10, 12 [WS]: Sl 1, [p1, k1] to last st, p1. Rows 13 & 14: Sl 1, k to end. Rows 15 & 16: Sl 1, p to end. Row 17 [RS]: Sl 1, WC9, p4[4, 6, 6, 6], place marker, k1, WC9, place marker, k1, WC9, p10[10, 14, 14, 14], WC9, place marker, k1, WC9, place marker, k1, p4[4, 6, 6, 6], WC9, p1. Row 18 [WS]: Sl 1, p to end. Row 19 [RS]: Sl 1, WC9, p to marker, m1, slip marker, k1, m1, WC9, m1, slip marker, k1, m1, WC9, p10[10, 14, 14, 14], WC9, m1, slip marker, k1, m1, WC9, m1, slip marker, k1, m1, p to cable, WC9, p1. 86[86, 94, 94, 94] sts. Row 20 [WS]: Sl 1, p to end. Row 21 [RS]: Sl 1, WC9, p to marker, m1, slip marker, k1, m1, p to cable, WC9, p to marker, m1, slip marker, k1, m1, p to cable, WC9, p10[10, 14, 14, 14], WC9, p to marker, m1, slip marker, k1, m1, p to cable, WC9, p to marker, m1, slip marker, k1, m1, p to cable, WC9, p1. 8 sts increased. Repeat these 2 rows 16[20, 21, 25, 30] times more. 222[254, 270, 302, 342] sts. Next Row [WS]: Sl 1, p31[35, 38, 42, 47], place next 47[55, 57, 65, 75] sts on st holder or waste yarn for first sleeve, p64[72, 78, 86, 96], place next 47[55, 57, 65, 75] sts on st holder or waste yarn for second sleeve, p32[36, 39, 43, 48]. 128[144, 156, 172, 192] sts on needle. Next Row [RS]: Sl 1, [p to cable, WC9] 4 times, p to end. Next Row [WS]: Sl 1, p to end. Repeat these 2 rows until work measures 3.5[4.5, 5.5, 6.5, 7.5] inches from underarm. *Work 3 rows in reverse stockinette st. Work 2 rows in stockinette st.
Repeat from * once more, then work 3 more rows in reverse stockinette st.
Next Row [RS]: Sl 1, [k2, p2] to last 3 sts, k3. Next Row [WS]: Sl 1, [p2, k2] to last 3 sts, p3. Repeat these 2 rows 10 times more. **Work 3 rows in reverse stockinette st. Work 2 rows in stockinette st.
Repeat from ** once more, then work 3 more rows in reverse stockinette st.
BO all sts using larger needle. Replace held sts of one sleeve on larger needle with RS facing, and rejoin yarn. Note: When working sleeves, do not slip first st of each row. 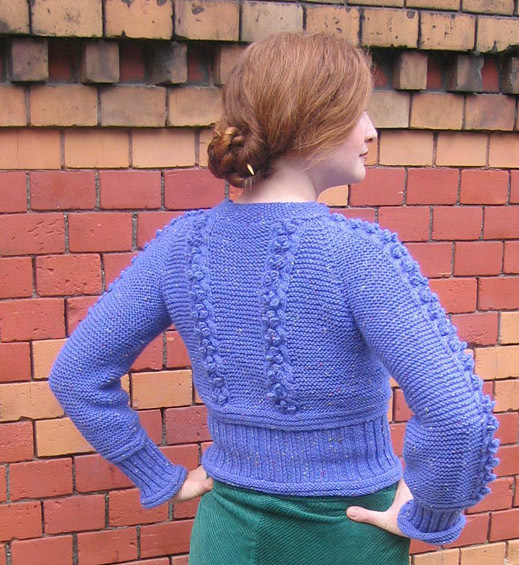 If desired, sleeves may be worked in the round on double-point needles; if you do this, alternate rows (rows marked "WS") are knit, rather than purled. Next Row [RS]: P to cable, WC9, p to end. Repeat these 2 rows until sleeve measures 6.5 inches less than desired length. Work Lower Border as for Body. On first row of border, decrease 3[3, 1, 1, 3] sts, evenly spaced. Work 3 rows reverse stockinette st, two rows stockinette st, then three more rows reverse stockinette st. BO all sts using larger needle. Using smaller needles, with RS facing and beg at upper corner of left front edge at base of collar, pick up and k 1 st for every 2 rows along garter stitch section of body, and 3 sts for every 4 rows along edge of lower border. Work 3 rows reverse stockinette st. Using safety pins, mark locations of 10 evenly spaced buttonholes. Next Row [RS]: [K to location of buttonhole, BO 2 sts] ten times, k to end. Next Row [WS]: [P to bound off sts, CO 2 sts using backward loop method] ten times, p to end. Work 3 more rows reverse stockinette st. BO all sts using larger needle. Editor's note: the designer is currently somewhere over the Atlantic ocean. Schematic will arrive shortly -- and will be placed in this spot when it gets here. Weave in ends and attach buttons. 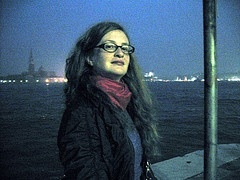 Stefanie Japel is currently trying to find the time to savor her last few moments living in Europe.